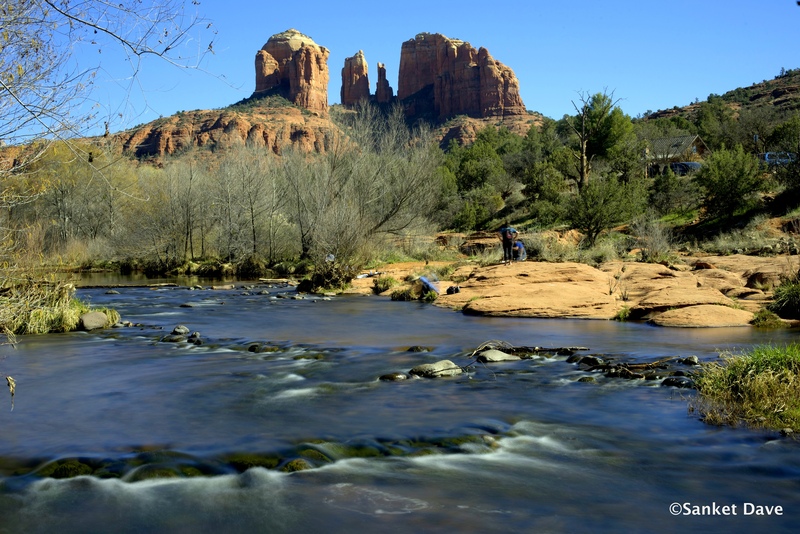 After much recommendation from S, reading A’s super blog post about her trip, me and S finally went to Sedona, AZ for President’s day weekend this year. We flew into Phoenix late Friday night, picked up our rental car and spent the night at a Holiday Inn close to the airport. 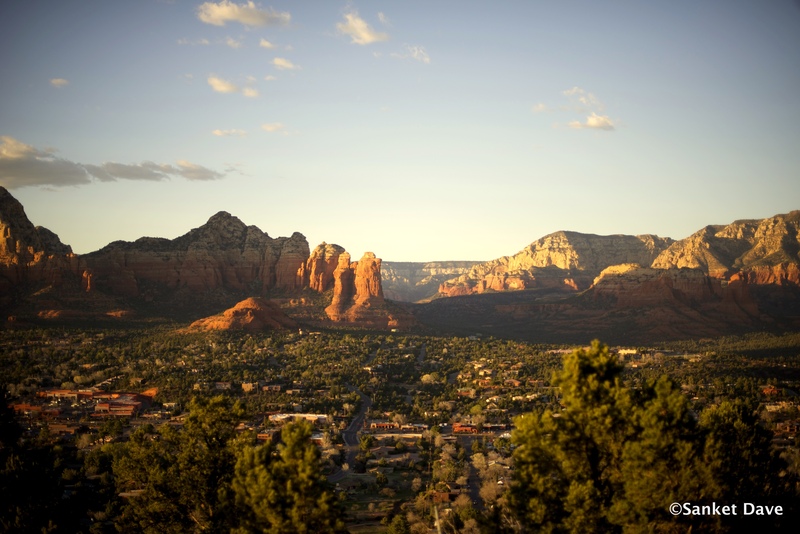 The next morning, we drove up to Sedona after picking up a few supplies at a Walmart on the way. 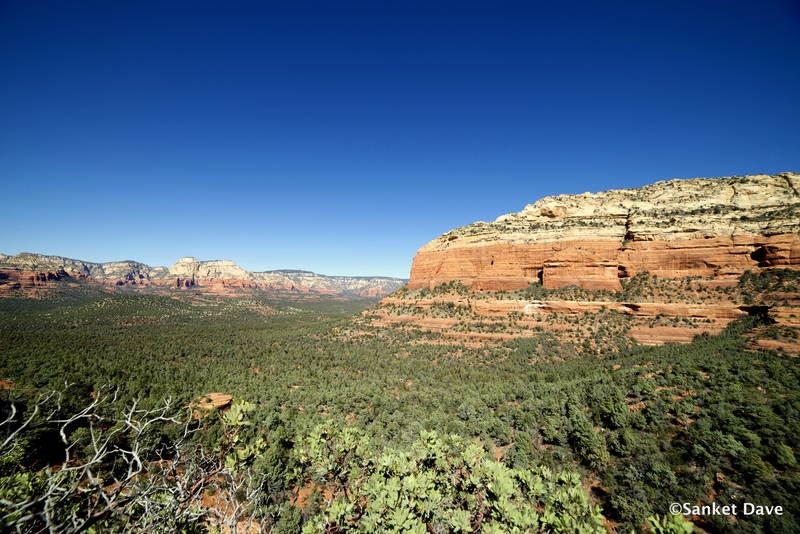 The scenery on the drive to Sedona is interesting in itself, with tall cacti and other desert-y foliage lining the freeway. 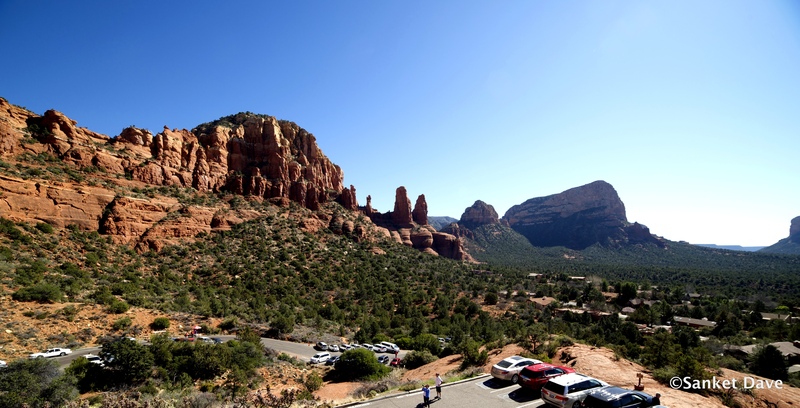 The drive from Phoenix to Sedona took about 2.5 hours with a bit of long weekend traffic. The rocks got prettier as we reached closer to Red Rock Country. We reached our first stop of the day, the Bell Rock, around late morning. 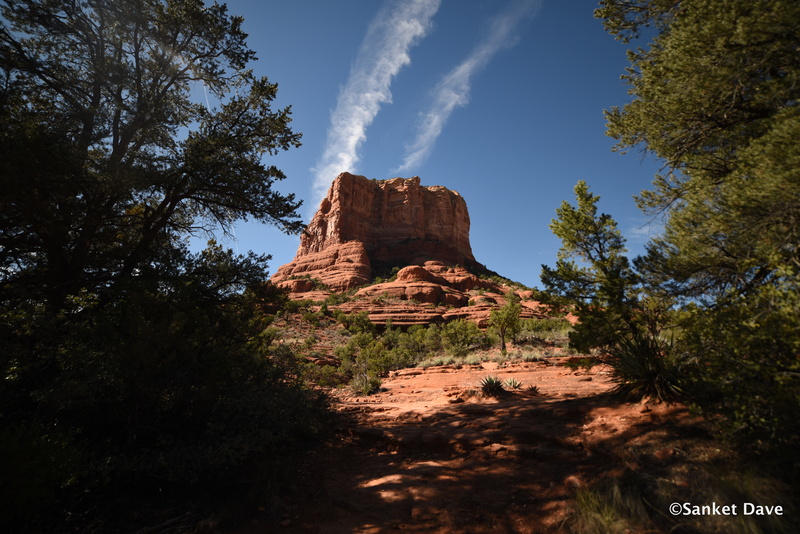 We picked one of the longer loops to hike, the Courthouse Butte trail, which starts from the Bell Rock Pathway and predictably goes around the Courthouse Butte rock. 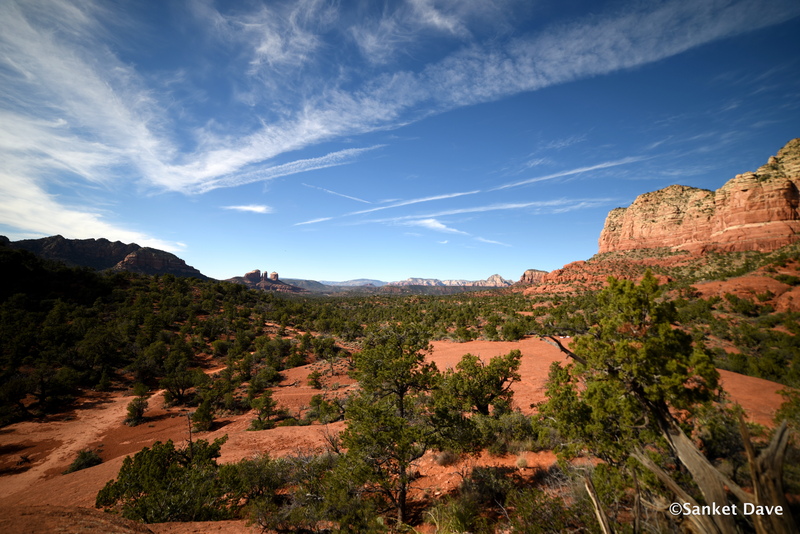 This is a gorgeous, winding trail through the massive red rocks, pretty easy for most people. As the trail climbs up a bit, we saw a beautiful panoramic view of the sandstone mountains and the valley. 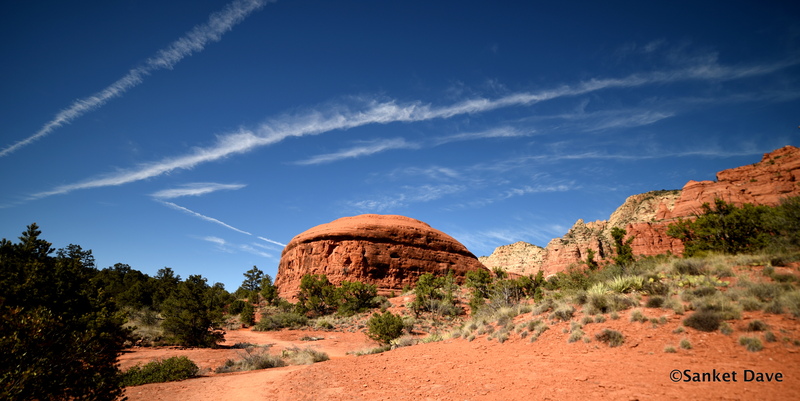 Coming around to the other side, we went off the trail a bit to get to the Spaceship rock, a lesser-known Sedona vortex. After hiking up to it, we sat on the rock for some time, the air was the perfect amount of cold, crisp and refreshing, there was a gorgeous view of the Cathedral Rock in the distance and beautiful scenery all around 🙂 I’d love to say I felt some energy from the vortex, but I think I’d feel that happy and blissful anywhere this pretty. 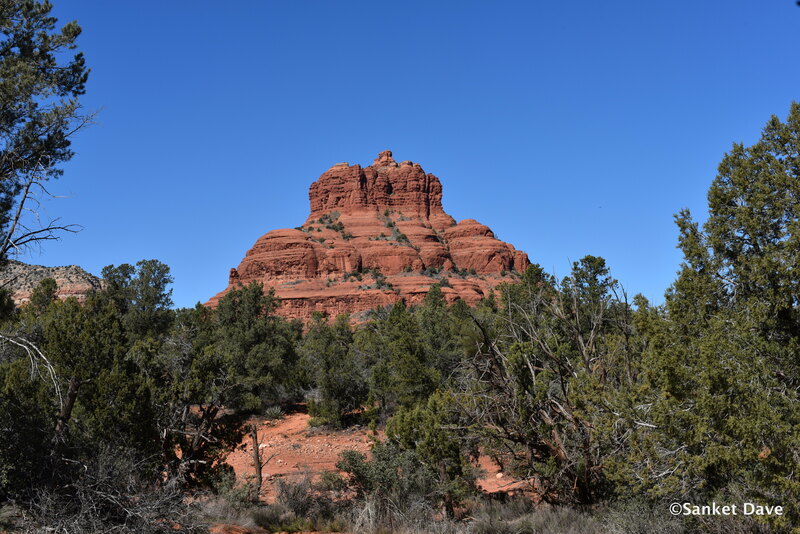 After spending some time there, with S taking pictures and GoPro panoramas, and wanting to throw pebbles at a couple doing yoga with their instructor because they looked too focused :|, we resumed our hike around the Courthouse Butte Rock towards the Bell Rock. 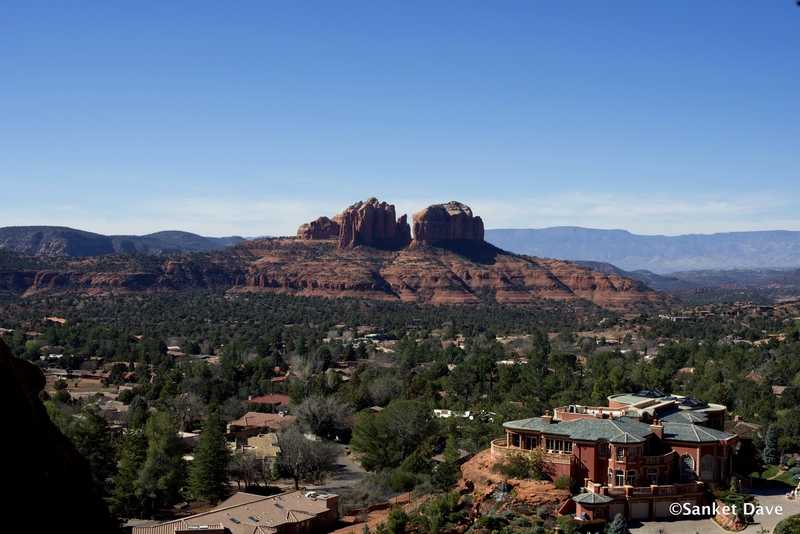 We then headed to our hotel, the Sedona Rouge Hotel & Spa, with a quick stop for lunch at Whole Foods on the way. The hotel was pretty good, clean and comfortable. After unpacking, I went to the hot tub with my Kindle, and spent some time soaking, reading and watching the amazing sunset colors, while S got us set up to see the India v/s Pakistan World Cup cricket match. We ordered room service for dinner with a delicious chocolate torte for dessert, enjoyed a superb performance by Team India, and spent an unconventional but awesome Valentine’s day ♥. 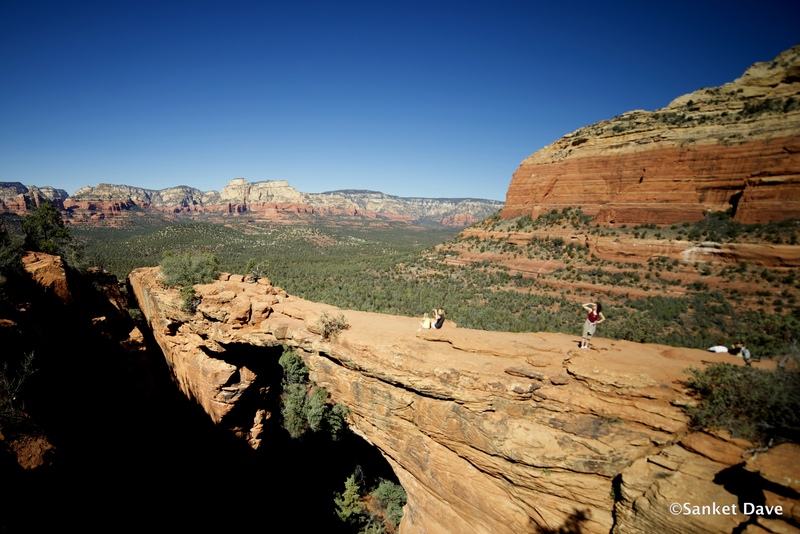 After a nice breakfast, this day began with one of my most awaited hikes, the Devil’s Bridge! The trail-head was pretty close to our hotel, we parked in the paved lot off the highway and started walking towards the mountain. The first mile or so is a dirt road where you can bring your vehicle if it’s a high-clearance one. As you go along, the views are pretty great, though the climb may be a bit steep for some. It was mid-afternoon by the time we were back down, so we headed to Picazzo’s for a delicious, nutritious and organic Italian meal. This is a cute indoor/outdoor establishment, with tons of gluten-free and vegetarian options. Me and S got two different pastas and both were really good. We had couple of hours to go before sunset, so we went back to the hotel for a short nap, and then left for the Airport Rock. Sunset at the Airport Rock was pretty, but not quite as mesmerizing as I had hoped it to be (It wasn’t cloudy enough). The Airport Rock has a nice view of the red rocks, this is a famous sunset point not for the actual view of the sun setting, but for the lovely colors reflected off the mountains, and clouds, if there are any. For dinner that night, we picked food up at the India Palace as we were not hungry yet after our late lunch, and then went to our first ever star-gazing tour! The spot was pretty good, an isolated, grassy and dark ground near a high school. Hardly any city lights to ruin your experience here. The place was well set up with chairs and much-needed blankets and parkas, it got pretty cold as the night progressed. Our guide was interesting and had a knack for story-telling as he started talking about the stars, constellations, planets, history and myths around how they got their names. I realized that many of the characters from one of my favorite books, the Harry Potter series, had names inspired by celestial objects, but I digress. Our guide also had a super cool long-range laser pointer that shot beams right up into the sky as he pointed stuff out for us to look at, a lot of people in our group (including me) were very interested in it, but he was quick to point out that it was a federal offense if you accidentally pointed your laser beam at a plane flying overhead, that got us all to pipe down, but I digress again. We spent the next couple of hours learning about the various stars and planets and their positions, and taking turns to look at them through the telescope. We finally saw the comet Lovejoy (S has been trying to find a good spot for weeks! ), and Jupiter with four moons, among other things. This was the last activity for this day, we went back to the hotel, had dinner and called it a night! We started Monday morning with a quick breakfast again, and packed to leave as this was going to be our last day in Sedona :-(. 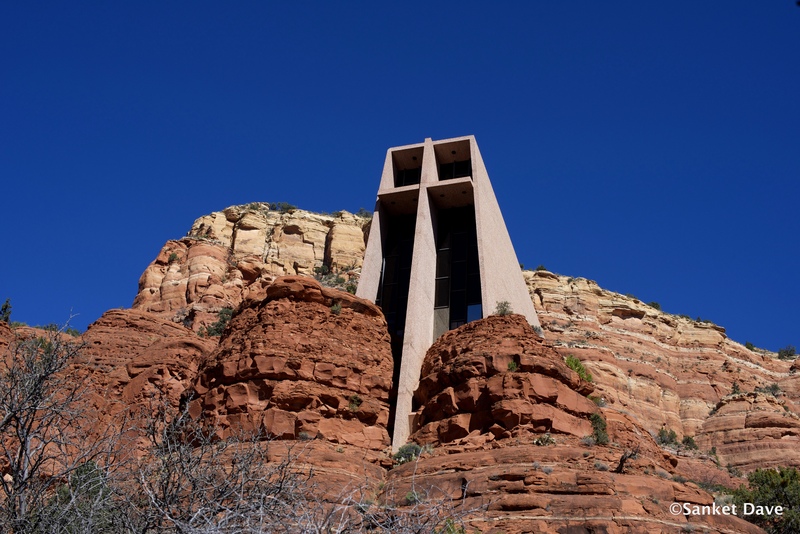 Our first stop for the day was Chapel of the Holy Cross, a lovely chapel nestled in a butte rock. It’s a simple structure that perfectly complements the vast rocky mountain in the background.This place has visiting hours, so keeping that in mind, we picked to start our day here. It was a little crowded as we got there, but they have parking attendants to help, and after a short 10-15 minute wait, we were able to find a spot and make our way up to the chapel. 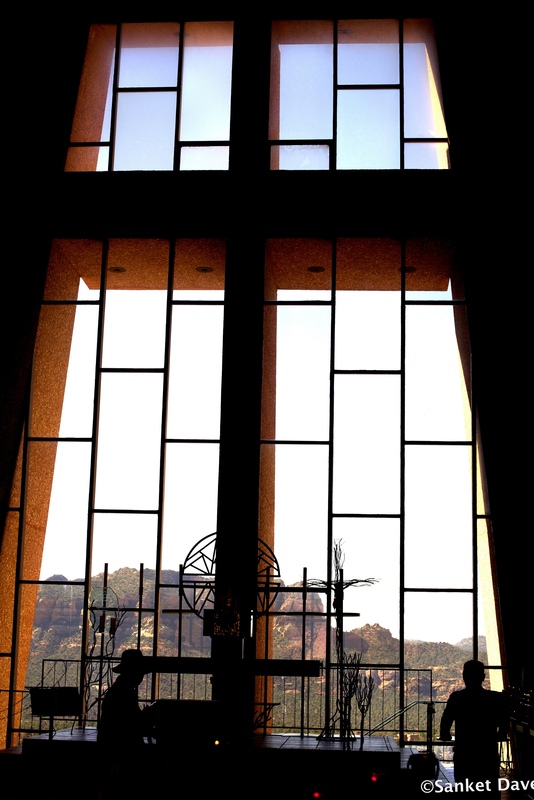 The peaceful interior is highlighted by the glass-pane wall behind the altar, with spectacular views all around! There is another famous vortex here, which I later found that were smack in the middle of. We found a nice spot on the rocks by the creek, with a breath-taking view of the cathedral rocks. S set up his tripod and clicked away while I put my jacket down, dipped my feet in the blessedly cool creek, enjoyed the view and sent up a silent thank-you for whatever brought me there to that moment. It was late-afternoon by then and we had to start heading to Phoenix for our flight back home, we stopped to take in the scenery at a couple of pullouts, and I started to think of things I couldn’t fit in this trip, like a spa session and hiking up the Cathedral rock. Soon, I hope!